Lindon has an abundant cultural and historical background. Originally settled in 1861, Lindon began as pioneers moved into what was then the Lindon grazing land. The town was originally named “String Town” because of the way the houses were strung up and down the street. An old linden tree (Tilia) growing in town in 1901 inspired the present (misspelled) name.Over the past century Lindon has seen organized development, but it has tried to remain true to its motto: Lindon: a little bit of country. All the amenities found in urban communities are accessible from Lindon, as well as a wide variety of outdoor activities, icnluding immediate access to several designated wilderness areas, including Mt. Timpanogos. Lindon offers beautiful views and a rural atmosphere in an urban setting. The city boasts accessibility to regional cultural, equestrian and commercial amenities. Lindon truly has become a desirable place to live, work, and relax! Lindon is easily accessibly by I-15 which connects the city to both Metropolitan Salt Lake City and the Orem/Provo metro area. The airport is 45 miles away and UTA provides daily mass transit service throughout the city and along the wasatch front. Lindon is also in close proximity to a wide variety of activities and services. We pride ourselves on being up to date with all assistance programs that can save you money on your new home. There are programs specific to Lindon that offer grants and downpayment assistance that we can assist you in securing. These programs will help to make your dream of owning a home in Lindon a reality. Contact us today so we can share these programs and incentives to you. The Red Sign Team has been helping people interested in buying or selling Lindon real estate for years. 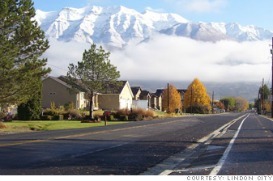 Our experts are familiar with the market trends for Lindon and Utah real estate in general. We are confident that we will be able to provide you with the friendly, knowledgeable, helpful and experienced real estate service that you deserve. Contact us today!